Spend a week on the celebrated Neapolitan Riviera, one of the Mediterranean’s most alluring holiday destinations. Enjoy delightful Sorrento and discover a region rich in history and culture on four wonderful guided excursions. Take a tour around the lively streets and squares of Naples, sail across the bay to the ‘Island of Dreams’, follow the twists and turns of the dizzying Amalfi Drive, and step into the past at Pompeii’s startling ruins. Fly to Italy and transfer to your hotel. Check-in, unpack and unwind before enjoying dinner in your hotel and taking the evening to familiarise yourself with your surroundings: your holiday home-from-home. What you do today is entirely up to you. Feel free to relax in your hotel, or get out and about and explore the shop-filled alleyways of Sorrento, watch the colourful sailboats go by from the town’s little beach, or visit one of its two small ports. Today you’ll have the chance to wander the eerie ruins of Pompeii, the ‘preserved’ Roman town famously lost for centuries when it was engulfed by a volcanic eruption in AD79. Across the bay, our second stop is Naples. Here you can join our guide to see Piazza Plebiscito, San Carlo Opera House and Castel Nuovo, take in the astonishing views across the city from Posillipo, and follow Spaccanapoli as it ‘splits’ the city’s old quarter in two. After a gentle walking tour through Sorrento’s oldest quarter, today’s optional excursion will take us into the Campania countryside for an insight into the region’s traditional farming and food. You’ll have the chance to taste and buy regional delicacies from a local wine cellar, an ancient olive press and a farm where the region’s famous buffalo mozzarella is still hand-made. It’s a trip no foodie will want to miss! The day will also include a drive through some of the region’s smaller towns, which boast some spectacular views of the ‘due golfi’ of Naples and Salerno. No trip to this part of the world is complete without a trip along the Amalfi Drive. Linking Sorrento and Amalfi, the road (originally built by the Romans) is carved out of the coastal cliffs. It provides spectacular views down to the Tyrrhenian Sea on one side and along towering cliffs on the other. You’ll also see Positano’s colourful Moorish-style houses, and be able to stroll through the streets of beautiful Amalfi. An experience-filled day ends with a journey to hill-top Ravello to explore its winding alleys and roofed passages. Today we cross from Sorrento to the idyllic isle of Capri. Here, Anacapri’s Villa San Michele charms visitors with beautiful architecture and spectacular views across the island. 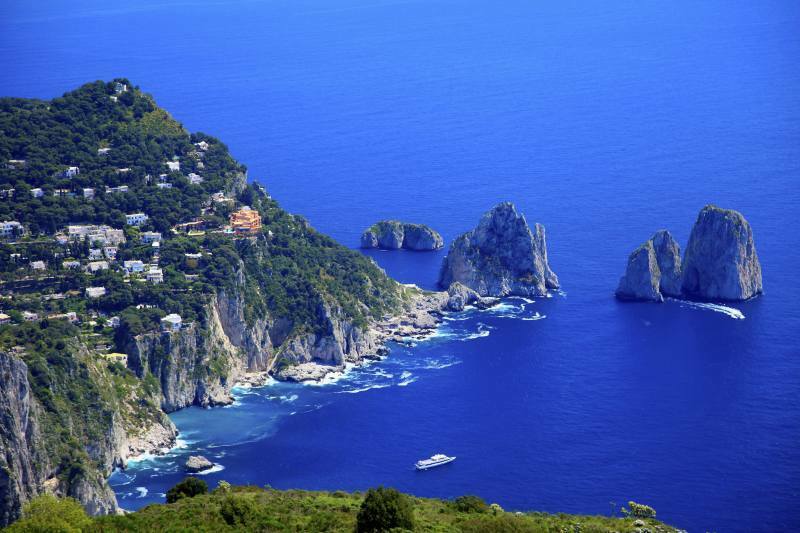 You’ll also have the opportunity to climb to Mount Solaro’s summit on a chair lift (payable locally), stroll through the Augustus Gardens, or visit Capri Town’s stylish boutiques. For the perfect end to your day why not join our optional boat trip to the Blue Grotto sea caves (booked locally)? If you’ve watched our video, you’ll already know why so many people think it’s an unmissable trip. Unwind at your hotel or relax in one of Sorrento’s delightful cafes on your final full day in Italy. It’s time to say “arrivederci” to Italy as you return to the airport and check in for your flight home.